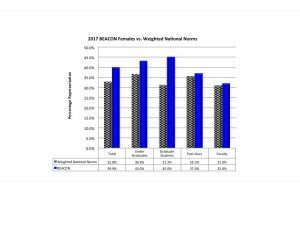 BEACON’s strategic efforts to increase overall female participation across all levels has resulted in 43% of BEACON participants are female, which is 31.1% higher than the National Norms of 32.8%. The number of female faculty is 39% (93 of 236), which also surpasses the national norm of 31.0% by 25.8%. Working strategically, BEACON recruited graduate students from across its partner schools, coordinated with faculty advisors at Minority Serving Institutions (MSI), and networked with other NSF STC colleagues to create a robust and diverse candidate pools of post-doc from which to hire. The number of female post-docs is 38% (34 of 90), which surpasses the national norm of 35.5% by 7%. Finally, the percentage of 2017 female undergrads is 43%, which also surpasses the national norms of 36.6% by 17.5%.